Doris “Granny D” Haddock died on March 9 at her home near Keene. She was 100 years old. In 1999 and 2000, Haddock walked from the Pacific Ocean in California to Washington, DC to call for public financing of elections at the national level. Thousands of people, including several members of Congress and former Texas Secretary of Agriculture Jim Hightower, joined Haddock for the last few miles of her walk to the U.S. capitol building. Maine and Arizona have public financing of state elections. Haddock was a lifelong activist for justice and democracy. She spent time in jail for non-violent civil disobedience. Haddock spoke at hundreds of rallies, including one at the Brattleboro town common in support of workers at the Brattleboro Reformer daily newspaper who were trying to form a union. Haddock was born in New Hampshire and lived there for her entire life. She spoke with an old New England accent, which can be heard on a documentary film about her life, "Run Granny Run." The film is available on DVD. For many years, Haddock worked at the Bee Bee Shoe company, eventually achieving the rank of assistant to the general manager. She appeared to be about 4' 6" tall. 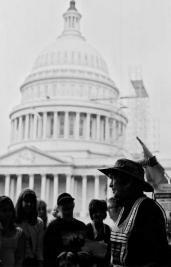 This photo show Granny D at the U.S. capitol in 2000, where thousands of people joined her for the end of her 3,200-mile walk for democracy. To enlarge the photo, please click on it. Submitted by Anonymous on Wed, 03/10/2010 - 16:22.